A story or a myth. Due to the constant misguided stories and heresay, I feel it is necessary to publish an article that has some answers as well as some mythological studies. This was a mysterious legend that became a person by form. He lived in the mountain village of Lanz, where he was said to cause mischief through the year. He is said to only be controlled by dancing, music, and bonfires in celebration of his demise by the inhabitants of the village. The festival goes on as a yearly celebration there even today. Villagers dress up in large sacks with decorations suited for the event traditionally called "Day of Miel-Otxin". The celebration closes after a huge bonfire fed by the villagers slowly goes out. It is said that Miel goes to rest in the bonfire, and is set to peace for an indeterminate duration of time. One notability is the fact that the Basques invented the trade of being a true Gypsy. The now-used term for the trade is tarnished, due to the pirating trade history of the western world. Originally, it was a form of a mobile business practice. You could say that the Basque people invented the term "door-to-door salesman". "Before the beginning had begun, before mountains became mountains, Basques were Basques." "If you are kind to your neighbor, and you share your bread, you may get some cheese back from him, and a friend too." "Everyone needs open space of their own, so don't take mine and keep yours, then I will not be content." "Children's eyes are priceless, they are still pure, and have not been stained from the bad." "The Witches of Zagarramurdi" has been a well known myth in all of Northern Spain and Southern France. I is celebrated every year since the 1600's on the 15th of August. There is a feast and a full celebration of the original witch-hunt that took place on August 15th, 1610. The myth speaks of 12 witches and a warlock that were burned at the stake. It was believed there was a cave that was home to these witches, and they would dance and cast spells upon the people of Zagarramurdi. It is commonly told as a children's story throughout the region, as famous there as the story of "Little Red Riding Hood" is to us. The modern celebration is called "The Feast of the Caves", in which (in tribute to the stake burning), a Lamb (Zikiro)is quartered, and is set near an open-pit fire, being occasionally turned (as a rotisserie). It traditionally is placed in front, so as not to drip it's fat into the flame, and cause smoke to alter the flavor. There is a recipe for the (Zikiro) dish on the recipes page(if you would like to celebrate too). 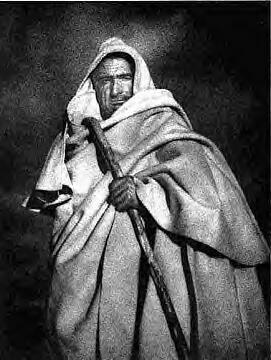 Below: A picture of a Basque Sorian Sheperd 1955. Typical of a Pyrenese Tradesman. Traditional Basque dances are an extremely important part of folk material, which brings us closer to the most ancient ways of life and values. In spite of the fact that a great deal of dances were lost as a result of rapid industrialisation - as, out of context, a great deal of the usefulness and value was lost - a whole catalogue of traditional Basque dances have been conserved and revitalised. These are brought to life by the hundreds of dance groups which exist in all parts of the country, at every festive occasion. Several types of dance can be distinguished according to their functions and character. Those related to social and playful celebrations are romerias (religious processions and festivals), are open circle dances, danced by a wide circle of men and women holding hands, or joined by handkerchiefs, who allow the specialist dancers, dantzari, to perform some often spectacular and difficult steps. At such moments those participating, as well as the spectators, take a secondary role in the proceedings as the admire the skill of the dantzaris. Such dances are for example the aurresku, the gizon dantza or the soka dantza among many others. The combat dances have two rival parties dancing, bearing swords, sticks or arches, which make up a series of eight or nine different choreographies. In Gipuzkoa some of these series have been preserved, such as the Brokel Dantza and its variations which go from the Troquel Dantza of Antzuola, the San Juan Dantzak of Berastegi, the dances of Lizartza and, somewhat different, the Corpus Christi dances in Oñati. In Bizkaia the series of the Dantzari Dantza is still performed all across the Duranguesado area, and in Alava the vestiges of these dances can be seen in the "paloteados" - dances in which the participants clash poles in time with the music - of the Rioja Alavesa, in communities such as Villabuena and outside this area, as in Pipaon. A third group is made up of canopy dances, usually performed with swords, which receive the generic name of ezpatadantzak. These can be danced by large groups of ten or more people carrying long swords, or groups of between two and four dancers, with short swords. The ezpatadantzak of Legazpi, of the Antigua de Zumarraga, in Gipuzkoa, and of Markina-Xemein, Arretxinaga, in Bizkaia are good examples of dances which in other places are preformed with staffs, for example in Tolosa, or with coloured poles, in Deba, both in Gipuzkoa. The carnival has its own types of dances. Nowadays some of these are interpreted outside the carnival period, such as the Azeri Dantza of Aduna which at present is danced on St John's day, or the Jorrai Dantza which no longer has a specific day for its performance. This is not the case of the Sorgin Dantza, dance of the witches, though, which is interpreted in Lasarte-Oria on Carnival Sunday, or of the Txino Dantza of Aretxabaleta. Ever since the first linguistic studies began in Europe, Basque, language spoken in the Basque Provinces, has been a magnet for popular-but-shaky theories. An aura of mystery has descended over the language and its speakers because of the scores of fantastical histories which have been contrived by scholars and pseudo-scholars over the years, attempting to connect the Basques and their language to everyone, from Atlantians to alien invaders from anothr world. Indeed, my own first interest in the Basques and their language came from less-than-credible reports that some Mormon scholar, whose name had been conveniently forgotten, claimed that the Basques were one of the lost tribes of Israel. In succeeding years, having studied Spanish for several years and taken a course from an expert on Basque folklore, both my interest and confusion have increased. T.V. documentaries offer DNA studies of the Basques to "prove" this or that bizarre theory, and otherwise-professional researchers, succumbing to the enigmatical allure of the language often stoop to using techniques that would be derided as unscientific in even the most basic linguistic courses. R.L. Trask, a leading scholar in Basque language studies, has often bewailed the low standards in much Basque research: "Words are wrongly cited, wrongly glossed, or wrongly analyzed . . . obvious errors by earlier investigators are copied and propagated. Sources of data are almost never identified, even the most basic works on Basque linguistics go unmentioned and apparently unread". Modern interest in Basque is for the most part hopelessly caught up in a romantic quest for one of the Holy Grails of linguistic studies irrelative for Basque. Yet it would seem that the one feature of Basque which makes the language so enticing to linguists and sensation-mongers everywhere is 'linguistic isolation'. The single feature which completely resists scientific conclusion. In researching the internal and external histories of Basque, I found the most fascinating characteristic of the people and the language to be a remarkable survival instinct. Over the centuries, all the pre-Indo-European languages of Western Europe have been obliterated, and not surprisingly. The pressure for change by outside forces has been intense. And yet Basque has survived, in large part because its speakers seem to know how and when to resist changes, and when to simply accept changes and move forward with a slightly different, but undefeated Basque Language. Basque (or Euskara) is spoken in the Basque Provinces and the Pyrenees (the mountain range which divides France and Spain). Approximately 80,000 Basque speakers live within French jurisdiction and the remaining 580,000 are on the Spanish side of the boundary. Emigrations have also brought some Basque speakers to the larger cities of France and Spain, to Belgium, England, Latin America, Australia, and the western United States, but the combined number of these transplanted Basques is likely no more than 20,000. Due to the limitations of a paper this length, the histories of the varieties of Basque spoken by these expatriates will not be included here. There are several Basque dialects in the Basque homeland. Luis Michelena divides the language into the Bizkaian, Gipuzkoan, High Navarrese, Aezkoan, Salazarese, Roncalese (now extinct), Lapurdian, Low Navarrese, and Zuberoan dialects. Until the 16th Century, Basque was an entirely oral language, and the scarcity of significant written records before that time makes reconstructing the history of Basque a linguistic puzzle of puzzles. In his article "Reconstructing the Pre-Proto-Basque Root," Joseba A. Lakarra cites the distinguished Basque scholar Antoine Meillet, who insisted that a language without relatives is a language without a history. However, Lakarra points out that it is more correct to say that such a language is without a prehistory. While it often seems that the history of Basque is lost in a nearly impenetrable haze, a handful of persistent scholars have discovered a good deal about both the language and its speakers down through the centuries. Archaeological evidence strongly suggests that the same people lived in the Basque Country continuously from Paleolithic times (about 10,000 years ago) continuing through the Bronze Age (about 3,000 years ago), and there is no evidence to suggest that any new population entered the area after that. Of course, that does not mean that no such invasion occurred. The discovery of Neolithic "Basque-type" skulls in the area has led some researchers to conclude that the Basque language developed "in situ," or within the Basque Country itself. Yet, however ancient the Basques claim to their homeland may actually be, their language has been conclusively linked to an ancestral language, "Aquitanian", which is the sole pre-Indo-European language still surviving in western Europe. The first records containing Aquitanian words appear in the 1st Century B.C. with the Roman conquest of Gaul; however, the texts are for the most part Latin, including only the names of random Aquitanian places, persons, and divinities (Gorrochategui 39). While proper names are not usually the most helpful evidence for analysis of a language, Trask notes that quite a few of the recorded names have interesting correspondences within the modern Basque Lexicons. Even this early and sparse record of Aquitanian shows evidence of previous language contact. Joaquin Gorrochategui notes that Aquitanian toponyms (place names) mentioned in Roman histories include borrowings from both Celtic (e.g. Lugdunum and Pimpedunni) and Iberian (e.g. Iluro and Elimberris Auscorum). As for the Romans, it appears that they were strangely unobtrusive in most of the Aquatanian lands. Of course, Latin contributed many words to Basque during the time of the Roman Empire. However, it is the very purity of many of these first recorded Latin borrowings, meaning specifically their lack of Basque elements, which suggests that there was minimal mingling of the two cultures (Gorrochategui 49). It was not long until hundreds of Latin words became fully integrated into Basque. Most of these were from areas of higher culture and administration. The scarcity of Basque records continued until the 9th Century A.D., when a gradual, steady increase began which continued throughout the Middle Ages. In the Basque Country, Roman influence had disappeared in the last half of the 3rd Century A.D., and the succeeding centuries brought warfare among the surrounding Germanic tribes. The need of the Basque people to unify and resist German invasion strengthened both the political cohesion and the language of the Basques, and led to the rise of the greatest Basque state in history: The Kingdom of Navarre. This glorious height of Basque political history, was also an especially interesting example of Basque linguistic attitudes. As previously mentioned, the 9th Century (during the time of the rise of Navarre) saw a steady increase in the number of Basque records, which continued until the decline of Navarre in the 16th Century. During the centuries before the advent of the printing press, it was the general rule that only languages with a good level of prestige were well-represented in written records; therefore, one may conclude that the Basque language was respected during this time. However, as Koldo Zuazo notes, speakers of Romance were imported to build the economic structure of the kingdom, and so despite the fact that Basque was in favor, it was never the official language of the Kingdom of Navarre (7-9). The Basque rulers were wise enough to realize that in order for the kingdom to flourish, business and administration needed a more common language than Basque. Following the fall of the Kingdom of Navarre, resulting from its division into the kingdoms of Navarre, Aragon, and Castile, the Protestant Reformation in France and the Catholic Counter-Reformation in Spain pulled the development of northern and southern Basque in opposite directions. The Protestant/nationalist emotion coming from France infused the northern Basque dialects with new prestige, as the Basques asserted their cultural and linguistic heritage. Aided by the newly-invented printing press, authors defended and glorified Basque, the first grammars and dictionaries appeared, literature flourished, and significant records of Basque finally appeared. The existence of multiple editions of many Basque publications from this time suggests that there was a fairly substantial number of literate Basques at this time. This increased awareness of the state of the language also led to the first attempt to codify and standardize Basque. By the end of the 17th Century, these northern Basque dialects had achieved high status. However, the southern Basque states during this time were hard hit by the Spanish Counter-Reformation which also spurred a reactionary assertion of control over fringe populations. As part of this, Castilian began to have an even greater influence on the southern dialects of Basque than it had previously. An economic decline in the 18th Century caused a corresponding decline in the language and literature of Basque. On the heels of this decline were harshly repressive measures by both France and Spain which further challenged the survival of the language. Because they did not support the French Revolutionaries, the northern Basques and their language were repressed by the French. Yet even as French was made the official language in the Basque Country and the prestige of Basque dropped, the people fought back by attempting internal language reforms in order to unify the Basque dialects. Though these attempts met with only minimal success, they demonstrate once again the buoyancy of Basque in the face of harsh linguistic repression. The southern Basque dialects suffered similar linguistic restraints laws were passed forbidding all languages except Castilian, and a sharp decline in the distribution of Basque speakers and in the prestige of Basque followed. But once again, Basque was preserved by an internal reaction that emphasized codification, grammars, dictionaries, literature, and the "purification" of Basque from all past foreign influence. Of course, by the end of the 19th Century, this drive for linguistic purification and isolation had probably gone too far. Native Basque speakers couldn't understand the language that the Basque purists were advocating. And yet, many of the suggested changes were practical, and with the First Congress of Basque Studies in 1918 and the formation of the Academy of the Basque Language, or Euskaltzaindia, some of these changes began to be gradually implemented in order to save the language from the crushing influences of France, Spain, and the Industrial Revolution. As it soon became evident that trying to purge the language of "non-Basque" elements was impossible, the focus shifted to steps such as orthographic codification and lexical modernization, and efforts were quite successful. For example, in 1964 Basque finally acquired a standard orthography; previous alphabets had varied widely, depending on whether a given dialect was nearer France or Spain. The new orthography, which has gained an impressive acceptance throughout the Basque Country is similar to the English alphabet, plus the following: the tilde above the letter n; not used in common words, however in modern Basque spelling, the letters C, Q, V, W, Y are used solely in foreign words or proper names. Not only were new language standards decreed by Euskaltzaindia, but they were implemented into actual life through a new Basque educational system targeted not only at children, but adults. The results were quite dramatic, as Basque was resurrected in areas where the language had been dead for a long time. In order to preserve their mother tongue, the Basques have somehow pulled off a series of imposed changes which most linguists would regard as next-to-impossible. Despite the recent movement to counteract the disappearance of Basque, its continued survival seems somewhat shaky at present, as it is encroached upon so forcefully by French from the north, Spanish from the south, and of course the pervasive, obliterating influence of English. In the northern Basque country, for example, the percentage of Basques who do not speak Basque has risen from 6% to 55% in the last 50 years despite the modern Basque schools, newspapers, and publications. In order to revive the language and unify the speakers of various dialects, Euskaltzaindia has been responsible since 1968 for the continual shaping of a unified literary Basque language, Euskara Batua, and the number of Basques favoring this artificial intervention is continually on the rise. Gabriel Aresti, a famous activist for the preservation of Basque once said, "In order for Basque to survive, the extra dialects must die". It is amazing to see that despite the affection they have for their local dialects, many Basques have begun to do just that they have begun to unify linguistically in order to preserve their language. As proven from the ancient past, the Basques are survivors. It is instinct.